Don’t overcomplicate strength training because a DVD said to. Harness the gains you seek with proven lifts and the principles of practice, efficiency, and intensity. I coached high school football for a year after I graduated college. Working with teenage linebackers taught me to condense and convey information quickly because they could only handle so much at one time. Now, several years into my professional career, I find the same training rules apply to adults. with excess miscellaneous, wonder exercises, I keep it simple and use 2-3 solid movements per session. Cut what’s meaningless and keep what’s productive. That’s my program mantra. I used to overcomplicate and overanalyze every program I wrote, which was dumb. Instead of spending limited time on a thousand lifts, it’s better to build strength with the basics. That’s what I’m here to help you do. Practice, efficiency, and intensity are elements that build a strong human. Whether you’ve been a competing powerlifter since the 1980s or a desk jockey looking for manly time with the iron, using 2-3 concentrated movements per session will hit all three elements. Oh, and it gets you strong. Strong like if Godzilla and Sasquatch had a baby named Thunder. Most people don’t view gym time as practice, but that’s exactly what it is. People who achieve excellence aren’t born excellent. They achieve excellence because they do what they’re excellent at often. A terrific housepainter most likely got that way through painting a lot of houses. If you want to be a great squatter, do lots of squats. Efficiency comes from time spent training quality movements. Concentrate your focus on a few solid exercises and you’ll spend less time in the gym. To be strong you must put yourself in the best position possible to efficiently generate force. Finding the best position for your body requires countless reps.
Reps must be performed at varying intensities for the same exercise at different times within a training session for maximum results. You don’t have to move on to a random exercise. You can continue to focus on a lift that requires practice. Take these three elements and apply them consistently to get big and strong. Forget “muscle confusion.” The body adapts with consistency, not randomness. Use the same lifts consistently and progress by building size and strength. Unless you’re in the midst of a seven-year plateau, training at maximum intensity, you don’t need a variety swing. It depends on what lifts you want to be good at and what lifts work well for your body. Luckily, there are movements faithfully devoted to the promotion of human strength. They should be familiar to you: squats, presses, deadlifts, and Olympic lifts. When you determine what you want to master and what lifts don’t leave your frame in shambles, all that’s left is to combine the elements: practice, efficiency, intensity, and your chosen lifts. The result? A supernova of progressive strength and size gains! Let’s get started with an example week. Under the intensity column, you’ll see @6 or @8. This nomenclature is based on rate of perceived exertion, not percentages. @6 means the bar moves fast without maximal force. You will still apply maximal force, but you’ll choose weight that doesn’t require it for speed. @8 means you could complete 2-3 more reps with the given weight until failure, but won’t. This is a snapshot of a program. It’s a Polaroid, not a movie showing full progression into and out of the program. Progression depends on your current needs and goals. It’s your job to determine those. The program volume isn’t remarkable. 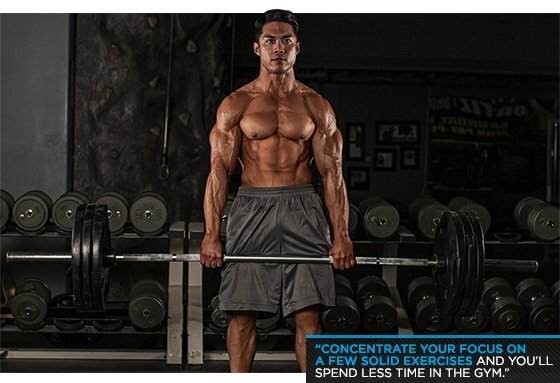 In fact, it’s low because it doesn’t take lots of volume to get strong; it takes focused and intense volume. This entry was posted in Body Shapers and tagged Health, Muscle, Physical exercise, Physical fitness, Strength training, Weight training.